Mother's Day is this Sunday so I'm posting a couple pictures that are very dear to my heart. This is my first Mother's Day that I get to hold my sweet baby in my arms. Last year I was pregnant and we had fun anticipating what our little girl would bring to our lives. And then she came into the world. This picture was taken by my sister just moments after she was born. Me and my girl. I will always remember this moment. I imagine when I look at my little girl, when she's heading off to kindergarten, to high school and college and when she gets married and has children of her own, I will remember this moment. Even when she's all grown up, she will still be my baby. She won't understand until she's a mom herself. Mom, I understand now. Speaking of my mom, this picture was also taken moments after my girl was born, also by my sister. She is holding my husband's finger with one hand and my mom's with the other. My mom is an amazing woman and I love that my little girl gets to see her all the time. She's a pretty great Nana! And I can't leave out my sister. Not only is she a fabulous mother, she's an awesome aunt! I love that she has taken so many priceless pictures of my daughter for me but what I really love is that she will be a huge part of her life. I think you can tell how much she loves her niece in this picture (also taken by her). I'm so blessed to have such amazing women that will not only watch my daughter grow but also influence her growth. I'm so thankful this Mother's Day. So Happy Mother's Day to all the moms out there!!! love it! that mom quote is amazing! SO sweet! Being a mom is truly the best thing in my life. Happy mothers day to YOU, momma! I love everything about this post! Photos are amazing and the quote is amazing. 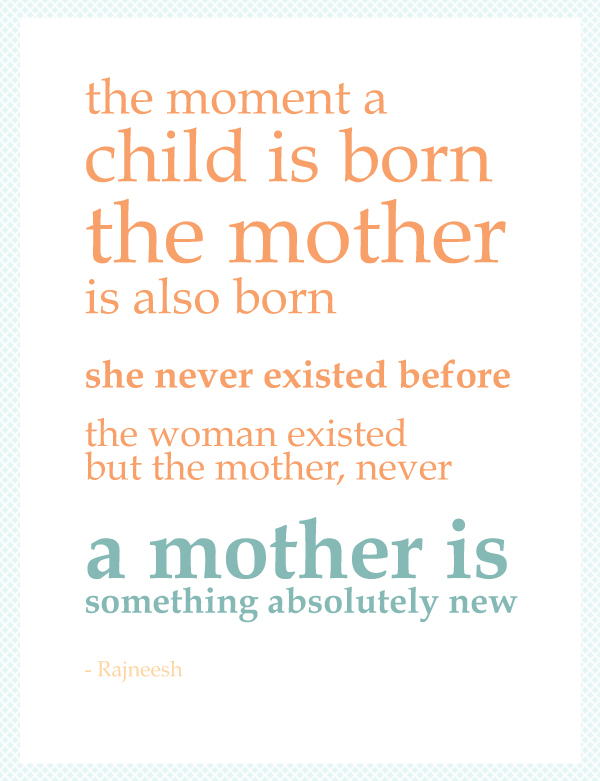 Enjoy your first Mother's Day! Yes.. I believe Ashley will bring all sorts of goodness to your baby girl. The pics are gorgeous of course! What a wonderful family legacy to have these images. Beautiful pictures!!! She is talented!! Happy Mothers Day to you too!! love these pictures. The quote is quite true. Darn, you made me cry! Those pictures are amazing! Beautiful post! And beautiful pictures! I love the quote that you included too, it's so true! Sweet Sweet pictures and Happy Mothers Day! Happy Mother's Day little sis....bring on more nieces and a nephew for me!! beautiful photos and love that quote. I’ve been reading your blog for a while and I remember reading this post when it was posted back in May. I read that quote back then and it has seeped into my subconscious and every once in a while it pops up to the front of my thoughts and honestly, causes my heart to hurt. See, my husband and I struggle with infertility. While I understand the point of this quote, I must respectfully disagree. The moment I became a mother was the moment we decided to start trying to have a baby. I thoroughly believe that a mother is not necessarily a woman with a child, but a woman that has a mother’s heart whether it be for her own children who may not be here yet, or for others’ children. There are women (mothers) all over this world with different circumstances; Women who want to be mothers, but are struggling with infertility, mothers who can’t have children, mothers who are adopting, even mothers who aren’t married yet but long to have a husband and a family. I believe that a mother is born, not at the moment her child is born because that is not always possible for every woman, but at the time her heart decides that she is a mom. She always existed. I am a mom. I just don’t have my babies in my arms yet. I do love your blog and I think you are an awesome person. I’m not leaving this comment to be one of those “mean, anonymous” commenters that just wants to disagree to be a jerk (that’s the LAST thing I want to do. Plus, I’m giving my information if you ever want to contact me about this), I’m only saying this because it is something incredibly near and dear to my heart that I believe people should be made aware of. I hope I’m coming across as simply giving a new perspective and not as scolding or confrontational. Hi Hannah - Thank you so much for taking the time to comment. I am so very sorry for any pain that quote has caused you. That is the very last thing I want to do with my blog. I appreciate you sharing your thoughts and feelings about this. I did not mean any ill will by the quote, I just came across it and it was one of those things that popped into my head many times after P was born and I wanted to share it. I sincerely apologize to you and anyone that may have found it offensive or insensitive. You never know who is reading posts and how the effect people so thank you for making more aware. I'll try to be more sensitive in the future. Truth be told, I have close friends who have struggled and are currently struggling with infertility and it breaks me heart to think that I may have offended them too. Thank you for your honesty.